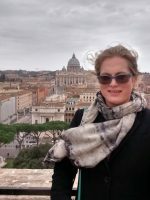 AHVA PhD candidate Gloria Bell has received an Assistant Professor position at McGill University in the Department of Art History & Communication Studies beginning Fall 2018. Her current research and teaching examines visual culture focusing on Indigenous arts of the Americas, primarily from the nineteenth century through to contemporary manifestations. Bell will be completing her doctoral defence The Eloquence of Things: Indigeneity and the 1925 Pontifical Missionary Exhibition in September of 2018.